The months from October 2010 through July 2011 have been the driest 10-month period in Texas since the state began keeping rainfall records in 1895. However, the current drought is not the worst Texas has experienced. A drought that began in 1950 lasted seven years before the state got a reprieve. However, Ron Sosebee, a professor emeritus with the Department of Natural Resources Management, said he considers the current drought to be the hardest. Jeff Johnson, assistant professor in the College of Agriculture Sciences and Natural Resources, said while he does not expect the drought to last that long, he does not see it ending any time soon. The Texas AgriLife Extension Service stated that so far there has been an estimated $1.8 billion lost from state cotton production alone and a total of $5.2 billion in lost income. Johnson said most of the loss is coming from areas around Lubbock, where most of Texas’s cotton is produced. There has also been an estimated 52 percent of cotton acreage abandonment, Johnson said. While most of the abandonments are from dryland farms, he said the intense heat has also caused irrigated farms to lose one-third of their yields. Another burden the state faces from the lack of rain, Sosebee said, is the number of fires that have spread across the state. To date, there have been more than 3.3 million acres in Texas ravaged by wildfires. Sosebee said a way farmers can help recover their dying lands is by preventing livestock from grazing. He also said he believes that catching rainfall will help farmers manage their resources better when dry spells like this occur. Ken Rainwater, director of Texas Tech’s Water Resources Center, said the department works to plan for drought conditions in terms of water rationing. He said the university’s water supply comes from a series of underground wells that are separate from Lubbock’s own water supply. The Water Resources Center, Rainwater said, focuses on three goals to keep campus foliage healthy, while maintaining a balance on the amount of water the school uses: augmentation, conservation and protection. “The key to augmentation is finding new water,” he said. “Conservation, of course, means using the water we do have carefully and not wasting it, whether domestically or for agricultural or industrial purposes. People need to prepare for the possibility that the drought may continue for another year, Sosebee said, or maybe longer, and conserve what little resources they have left. Despite the possible future the state faces, Johnson said much of the drought is out of human control. Because of the severe drought, in our part of the world, our cities have restricted their residents to watering their lawns twice and week, after 7 p.m. While some of you may have been accustomed to doing this for some time now, I think the new water restrictions have been an eye opener for many in West Texas. To help us all save water and money, below is a list of ways you can save water on your lawn. Kentucky Bluegrass can survive extended periods of drought by slowing growth, turning straw colored and entering summer dormacy. Once water becomes available again, it can initate new growth form the crown of each plant. Perennial Ryegrass has very little tolerance for dry conditions and usually doesn't grow in non-irrigated areas. Warm Season Grasses such as bermudagrass, zoysiagrass, and St. Augustinegrass actually prefer warm conditions and can tolerate most drought conditions due to their deep and extensive root systems. The amount water depends on the type of grass you have. In general, applying 3/4" to 1 inch per week is the sufficient during the hot summer months. Rainfall and cooler temperatures means your lawn requires less water. Over watered lawns lead to excessive growth, summer fungal diseases and more frequent mowing. Excessive watering of lawns also wastes water, increases the need for fertilizer and pesticide run-off. Too much water can be deadly. When grass is over watered, the roots are unable to breathe, and eventually rot. Often times an over watered lawn looks like it needs water, it will turn yellow and wilt. 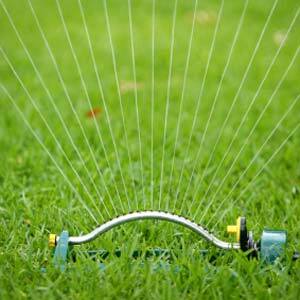 Too little water during summer months your grass will go dormant. Grass color will lighten and most lawns will recover when water returns. You can tell when your lawn is thirsty by doing a foot test. Walk across the grass and if it doesn't "spring" back up and your footprints are visible, this is the first sign it needs water. Deep and infrequent watering will maintain a healthy root system and helps to reduce weed infestation. Water your lawn slowly to allow it to soak into the soil and prevent wasteful run off. Water in the early morning when evaporation is lowest (5am to 10am). Mow your grass at the right height. Longer grass increases the depth of the root system, shade the soil, and help with drought tolerance. Annual core aeration can loosen compacted soil and allow water to soak deeper into the ground.